“[T]he principles of thermodynamics have been in existence since the creation of the universe” (Cengel and Boles, 2002, p. 2, emp. added). So states a prominent textbook used in schools of engineering across America. Indeed, these principles prove themselves to be absolutely critical in today’s engineering applications. Much of the engineering technology available today is based on the foundational truths embodied in the Laws of Thermodynamics. As the writers of one engineering thermodynamics textbook stated: “Energy is a fundamental concept of thermodynamics and one of the most significant aspects of engineering analysis” (Moran and Shapiro, 2000, p. 35). Do these laws have application to the creation/evolution debate as creationists suggest? What do they actually say and mean? How are they applied today in the scientific world? Let us explore these questions. The word “thermodynamics” originally was used in a publication by Lord Kelvin (formerly William Thomson), the man often called the Father of Thermodynamics because of his articulation of the Second Law of Thermodynamics in 1849 (Cengel and Boles, p. 2). The term comes from two Greek words: therme, meaning “heat,” and dunamis, meaning “force” or “power” (American Heritage..., 2000, pp. 558,1795). Thermodynamics can be summarized essentially as the science of energy, including heat, work (defined as the energy required to move a force a certain distance), potential energy, internal energy, and kinetic energy. The basic principles and laws of thermodynamics are understood thoroughly today by the scientific community. Thus, the majority of the work with the principles of thermodynamics is done by engineers who simply utilize the already understood principles in their designs. A thorough understanding of the principles of thermodynamics which govern our Universe can help an engineer to learn effectively to control the impact of heat in his/her designs. Though there are many important thermodynamic principles that govern the behavior of energy, perhaps the most critical principles of significance in the creation/evolution controversy are the First and Second Laws of Thermodynamics. What are these laws that not only are vital to the work of an engineer, but central to this debate? The First Law of Thermodynamics was formulated originally by Robert Mayer (1814-1878). He stated: “I therefore hope that I may reckon on the reader’s assent when I lay down as an axiomatic truth that, just as in the case of matter, so also in the case of force [the term used at that time for energy—JM], only a transformation but never a creation takes place” (as quoted in King, 1962, p. 5). That is, given a certain amount of energy in a closed system, that energy will remain constant, though it will change form (see Figure 1). As evolutionist Willard Young says in defining the First Law, “Energy can be neither created nor destroyed, but can only be converted from one form to another” (1985, p. 8). the principle of the conservation of energy is considered to be the single most important and fundamental ‘law of nature’ presently known to science, and is one of the most firmly established. Endless studies and experiments have confirmed its validity over and over again under a multitude of different conditions (p. 165, emp. added). This principle is known to be a fact about nature—without exception. In the nineteenth century, Lord Kelvin and Rudolph Clausius (1822-1888) separately made findings that became known as the Second Law of Thermodynamics (Suplee, 2000, p. 156). The Second Law builds on the first, stating that though there is a constant amount of energy in a given system that is merely transforming into different states, that energy is becoming less usable. Extending our wood burning illustration above, after the wood is burned, the total amount of energy is still the same, but transformed into other energy states. Those energy states (e.g., ash and dissipated heat to the environment) are less retrievable and less accessible (see Figure 2). Another way of stating the Second Law then is “The universe is constantly getting more disorderly!” Viewed that way we can see the Second Law all about us. We have to work hard to straighten a room, but left to itself it becomes a mess again very quickly and very easily. Even if we never enter it, it becomes dusty and musty. How difficult to maintain houses, and machinery, and our own bodies in perfect working order: how easy to let them deteriorate. In fact, all we have to do is nothing, and everything deteriorates, collapses, breaks down, wears out, all by itself—and that is what the Second Law is all about (1970, p. 6). Entropy is simply a fact of nature. Entropy can be minimized in this Universe, but it cannot be eradicated. That is where engineers come in. We must figure out ways of minimizing energy loss and maximizing useful energy before it is forever lost. Thousands of engineering jobs are dedicated to addressing this fundamental fact of the Second Law of Thermodynamics. Your energy bill is affected directly by it. 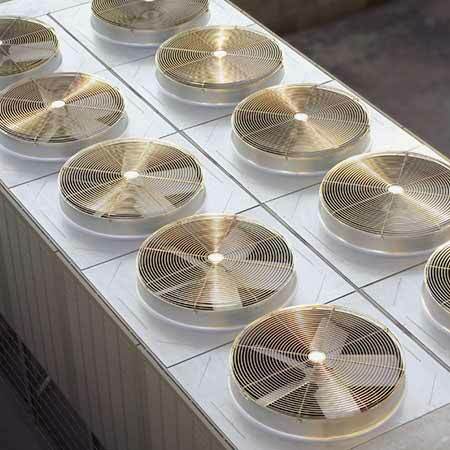 If the Second Law was not fixed, engineers could not develop the technology necessary to maximize usable energy, thereby lowering your energy costs. This concept is analyzed and quantified by engineers using what thermodynamics textbooks call “efficiencies.” Efficiencies reduce to “energy out” (desired output) divided by “energy in” (required input) (Cengel and Boles, 2002, p. 249). For instance, a turbine is the “device that drives an electric generator” in steam, gas, or hydroelectric power plants (p. 188). By taking the actual work done by the turbine and dividing it by the work required to operate the turbine, an engineer can calculate the turbine’s efficiency. Discovering or designing ways to maximize that ratio can be lucrative business for an engineer. Another type of efficiency is called “isentropic efficiency.” For a turbine, isentropic efficiency is essentially the ratio of the amount of work that is done by the turbine to the amount of work that could be done by the turbine if it were “isentropic,” or without entropy. Again, the closer an engineer can approach 100% efficiency, the better. However, engineers know they cannot reach 100% efficiency because of the Second Law of Thermodynamics. Energy loss is inevitable. As the engineering textbook Thermodynamics: An Engineering Approach states: “Well-designed, large turbines have isentropic efficiencies above 90 percent. For small turbines, however, it may drop even below 70%” (Cengel and Boles, p. 341). It has been my experience that many people do not appreciate how uncompromising the Laws of Thermodynamics actually are. It is felt, perhaps, that the Laws are merely general tendencies or possibly only theoretical considerations. In reality, though, the Laws of Thermodynamics are hard as nails, and...the more one works with these Laws, the deeper respect one gains for them (1986, 9:8, emp. added). Evolutionist Jeremy Rifkin stated that “the Entropy Law will preside as the ruling paradigm over the next period of history. Albert Einstein said that it is the premier law of all science; Sir Arthur Eddington referred to it as the ‘supreme metaphysical law of the entire universe’” (1980, p. 6). God designed it. Creationists believe it. Engineers use it. Evolutionists, as will be shown, cannot harmonize it with their theory. Some evolutionists argue that creationists take the Laws out of context when applying them to the creation/evolution debate. Mark Isaak, the editor of the Index to Creationist Claims, for instance, alleges that creationists “misinterpret” the Second Law of Thermodynamics in their application of the law to the creation/evolution controversy (Isaak, 2003). So what is the proper context for the Laws of Thermodynamics? Do these principles apply to the debate or not? Are creationists “misinterpreting” the laws? A host of examples could, of course, demonstrate how mechanical engineers use the Laws of Thermodynamics in design today. Without these laws being fixed and well-understood by the scientific community, such designs would be impossible. As explained earlier, the vast majority of the work engineers do with the laws today is in their application to nature, rather than the study of the laws themselves. The laws already are thoroughly understood. To determine if creationists are “misinterpreting” the Laws of Thermodynamics or inaccurately applying them to the creation/evolution debate, consider three engineering examples that demonstrate the Laws in action. Example #1. Perhaps one of the most celebrated—and appreciated—engineering designs of the 20th century pertaining to thermodynamics is the air-conditioning system. 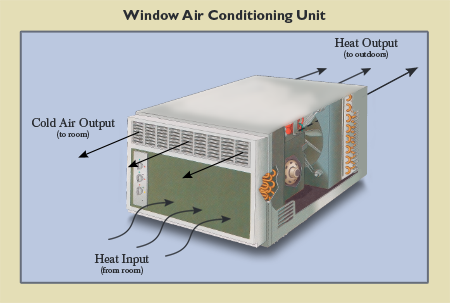 Briefly explained, an air-conditioning unit is a machine that was designed to acquire a large quantity of air from a system (e.g., a home or the interior of a car), remove heat from that air, and then release the cooled air back into the system, while disposing of the heat into a “heat sink” (e.g., the outdoors). Simply stated, this process occurs through what many engineers call a vapor-compression refrigeration cycle (Moran and Shapiro, 2000, p. 517)—a cycle heavily rooted in the Second Law of Thermodynamics. In this cycle, a fluid (called a “refrigerant”) in “super-heated” vapor form flows through a pipe and into a compressor where it is compressed into a hotter gas with a higher pressure. From the compressor, the gas moves into the next phase of the cycle, composed of a set of coils (a condenser). As the refrigerant flows through the condenser, some of the heat is removed, and the refrigerant condenses into a liquid. Moving through an expansion valve, the refrigerant is “throttled” into a colder, lower-pressure mixture of liquid and vapor. One principle of thermodynamics, as noted originally in 1824 by the French physicist Sadi Carnot (Suplee, 2000, p. 156), indicates that in a system, heat will move from higher temperature sources to lower temperature sources until an equilibrium temperature is reached (Incropera and DeWitt, 2002, p. 2). This principle is directly utilized in the final step of the cycle. In this step, the low temperature refrigerant exiting the expansion valve moves through a set of coils called the evaporator that absorbs heat from the refrigerated area. At this point, the refrigerant has absorbed enough heat to return to its initial vapor state, and is ready to repeat the cycle. In what way did the thermodynamic laws come into play in this process? One of the major responsibilities of the engineer is to take the principles stated by the laws of science and understand them enough to be able to apply them in new designs. In order to apply scientific laws, engineers must formulate ways to quantify the concepts articulated by those laws. In the case of the above example, engineers must take the principles stated in the Laws of Thermodynamics in particular and quantify them. 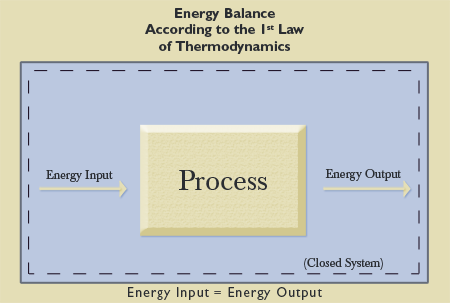 To apply the First Law of Thermodynamics to design, engineers must first quantify the energy that is or will be present in a system (work, potential energy, kinetic energy, heat, internal energy, etc.). As the First Law states, the amount of energy present in the system remains constant during a closed system process—a system that “consists of a fixed amount of mass, and no mass can cross its boundary” (Cengel and Boles, 2002, p. 9). The engineer must calculate the amount of energy utilized within a system before a process and set it equal to the amount of energy present in the system after the process. The energy may change forms (i.e., work is partially transformed into heat), but the total amount of energy in the system remains constant. Considering the above example again, engineers would quantify the energy that is being inserted into the system (such as the electrical energy required to run the compressor) and the energy that results from the processes in the system (such as the heat released into the “heat sink”). 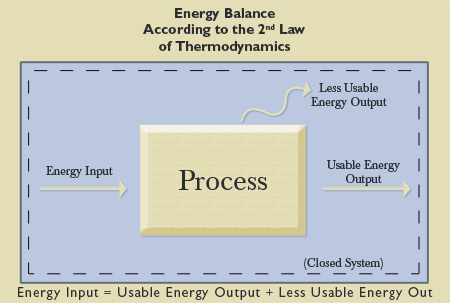 The energy would then be equalized, with a primary concern being to achieve the optimum usable energy as an output, understanding that there will be a certain amount of wasted energy due to the Second Law of Thermodynamics (see Figure 3). The more usable energy achieved in the system processes, the more financially desirable the process, and the less energy wasted. In order to facilitate this endeavor, a quantification of the principles inherent in the Second Law of Thermodynamics is essential. As noted earlier, efficiencies are essentially a measure of the usable energy achieved during a process. Achieving optimum energy efficiencies in the design of different machines helps to reduce the inevitable entropy implied by the Second Law. Again, in the above example, in order to accomplish the refrigeration cycle, a compressor is used. To run the compressor, work (energy) must be used to compress the refrigerant to the right pressure to go through the condenser. Engineers must design these compressors to yield optimum efficiency, taking the Second Law into account, since the refrigeration/air conditioning process is not an isentropic one (i.e., a process with no entropy). The amount of energy required to operate the compressor to pressurize the refrigerant is more than the heat transfer that will occur from the hot room to the hotter outdoors due to the presence of the Second Law. In other words, usable energy is lost along the way (see Figure 4). This unalterable principle, which governs and permeates all of nature, will be shown to contradict the theory of evolution. Available energy is gradually being consumed. Engineers can slow the process, making the loss as efficient as possible, and maximizing energy usage. However, energy loss cannot be stopped due to the existence of the exceptionless Second Law of Thermodynamics. Example #2. 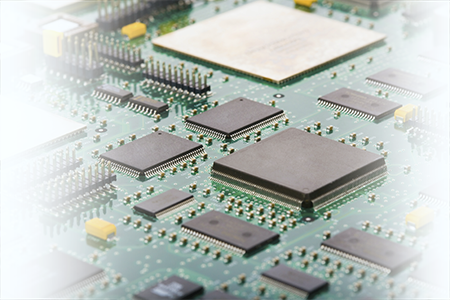 A second thermodynamic engineering example is seen in much of today’s electronic equipment. For example, a computer has many microchips (see Figure 5). Due to an understanding of the First Law of Thermodynamics, when work is done within a computer by a microchip, an extremely high amount of heat is released to its surroundings. As noted earlier, the Laws stipulate that the amount of energy that goes into a process must equal the amount of energy that results after the process. As computers get more powerful, the heat energy output becomes a more serious problem, especially considering that the computer components are moving closer to each other as computers become more compact. The intense heat that radiates from chips must be transferred away from the computer, or melting will occur among the system components. Faced with this significant problem, engineers are called upon for solutions. How can we continue to decrease the size of computers, increase their power, and still have the ability to transfer enough heat out of them to preserve their components? By adjusting the amount of power input and the rate at which heat is released in the First Law equation, engineers can ensure that the system will not be overloaded with heat. Example #3. A third example of how engineers use thermodynamic principles in design is demonstrated by the examination of a vapor power plant that produces electrical power (see Figure 6). 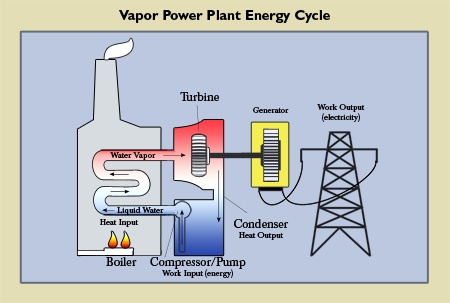 Similar to the air conditioning system, the vapor power plant cycle also often is composed of four components. According to Moran and Shapiro, in this cycle liquid water is passed through a boiler which has a heat input. The water then changes phase to a vapor and enters a turbine, where it expands and develops a work output from the turbine (electrical power). The temperature of the vapor drops in the turbine and then goes through a condenser where heat is passed from the vapor into a “cold reservoir.” Some of the vapor condenses to a liquid phase. The water then passes into a pump (compressor) where the water is returned to its initial state before repeating the cycle (2000, p. 229). Again, engineers recognize the limitations imposed by the Second Law, and must minimize entropy as much as possible when designing the turbine and pump (recognizing entropy cannot be eliminated). The more efficient the cycle components are designed, the more power the world gets and the less wasted energy there will be. To recap, the engineering community utilizes the simple concepts inherent in the First and Second Laws of Thermodynamics—laws which govern nature in a very straightforward manner. The First Law: Energy in any closed system is constant. The amount of energy in a system before a process must equal the amount of energy that is in the system after the process (though it will change form). 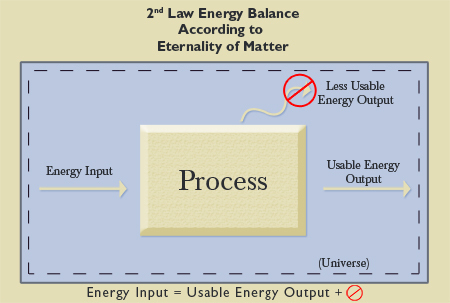 The Second Law: The energy in a given system is becoming less usable. Some of the usable energy inevitably will be lost, no matter what measures are taken. It would be beneficial if entropy were zero for an automobile’s fuel system. We could buy one tank of gas and simply reuse all of its energy indefinitely! The fuel would not transform into wasted, less usable forms (heat, exhaust, etc.). When understood properly, the Laws of Thermodynamics apply directly to the creation/evolution controversy in precisely the same way they apply in the above examples to the work of engineers. In fact, these foundational truths utilized daily by the engineering world, have eternally significant, spiritual implications in that they prove that God exists. How so? If there is no God, the existence of the Universe must be explained without Him. The Big Bang theory claims that all matter in the Universe initially was condensed in a sphere the size of a period at the end of this sentence (see Thompson, et al., 2003, 23:32-34,36-47). However, this theory offers no explanation for the origin of that sphere. The only logical possibilities for its existence are that it popped into existence out of nothing (spontaneous generation), it always existed, or it was created (see Figure 7). Consider the entire physical Universe as a system consisting of all mass/matter/energy that exists in the Universe. Without a God, this Universe would have to be a closed system. Since our system encompasses the entire Universe, there is no more mass that can cross the system’s boundary, which necessitates our system being closed—without the existence of God. If mass, matter, and energy could enter and/or exit the system, the system would be an open system—which is the contention of a creationist. However, without a God, the entire physical Universe as a system logically would have to be a closed system. Atheists must so believe in order to explain the Universe without God. 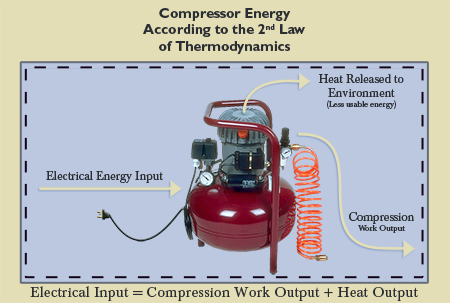 The First Law of Thermodynamics states that in a closed system, the amount of energy present in that system is constant, though it transforms into other forms of energy, as in the case of the above compressor. So, if the Universe as a whole initially contained no mass/matter/energy (energy input is equal to zero), and then it spontaneously generated all of the mass/matter/energy in the Universe (energy output is unequal to zero), the First Law would be violated. Applying the earlier example of the compressor, this circumstance would be equivalent to saying that the sum total heat loss and compressor work is greater than the electrical input—which is impossible. Without intervention from an outside force, the amount of mass/matter/energy in the Universe would have remained constant (unchanged) at zero. As was mentioned earlier, there are no exceptions to laws, or else they would not be laws. The First Law of Thermodynamics has no known exceptions. As previously explained, the Law is accepted as fact by all scientists in general and utilized by engineers in particular. Therefore, the Universe, composed of all mass/matter/energy, could not have spontaneously generated (popped into existence on its own) without violating the exceptionless and highly respected First Law of Thermodynamics. The energy level of the Universe would not have been constant. Spontaneous generation would be the equivalent of a zero energy input to a system and a non-zero output (see Figure 8). The Universe could not have come into existence without the presence and intervention of a Force outside of the closed system of the entire physical Universe. The Universe therefore must be an open system that was created by a non-physical force (not composed of mass/matter/energy) outside of the physical boundary of this Universe (above nature, or supernatural) with the capability of bringing it into existence out of nothing. That Force can be none other than the supernatural God of the Bible. Scientifically speaking, the Universe could not and did not spontaneously generate. Unfortunately, though this truth is so glaringly obvious, there has been a recent surge of sentiment in the impossible notion that this Universe could have created itself—that something could come from nothing. British evolutionist Anthony Kenny (1980), physics professor from City University in New York, Edward Tryon (1984), and physicists Alan Guth from MIT and Paul Steinhardt of Princeton (1984) are just a few who are open proponents of this notion. However, the truth still stands. Until the First Law of Thermodynamics ceases to be a fundamental law explaining this Universe, the spontaneous generation of this Universe from nothing is impossible. Again, considering the entire Universe as a system necessitates that it be a closed system. The Second Law of Thermodynamics states that though energy in a closed system is constant (First Law of Thermodynamics), that energy is transforming into less usable forms of energy (i.e., the Universe is “running down”). This process is irreversible. There is a finite amount of usable energy in the Universe (which explains the widespread interest in conserving energy). That usable energy is depleting according to the Second Law, as illustrated by the less usable heat output in the examples cited earlier. Engineers strive to slow this inevitable depletion of energy, but it cannot be stopped. If the Universe has always existed (i.e., it is eternal), but there is a finite amount of usable energy, then all usable energy already should be expended (see Figure 9). Yet, usable energy still exists. So, the Universe cannot have existed forever. It had to have a beginning. 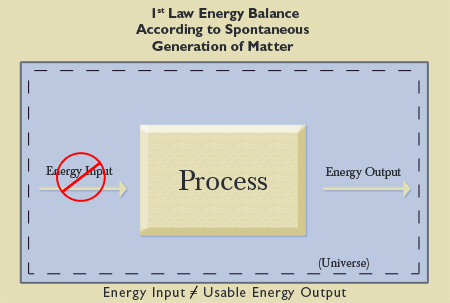 The eternality of matter would be the equivalent of a system with an energy input and 100% usable energy output (see Figure 10). The lingering decline predicted by astronomers for the end of the world differs from the explosive conditions they have calculated for its birth, but the impact is the same: modern science denies an eternal existence of the Universe, either in the past or in the future (1977, p. 30, emp. added). In his book, God and the Astronomers, Dr. Jastrow reiterated this truth: “Now three lines of evidence—the motions of the galaxies, the laws of thermodynamics, the life story of the stars—pointed to one conclusion; all indicated that the Universe had a beginning” (p. 111). To repeat, there are only three possible explanations for the existence of matter in the Universe. Either it spontaneously generated, it is eternal, or it was created. Atheists use the theory of evolution in an attempt to explain the existence and state of the Universe today. In order for the theory of evolution to be true, thereby accounting for the existence of mankind, either all of the mass/matter/energy of the Universe spontaneously generated (i.e., it popped into existence out of nothing), or it has always existed (i.e., it is eternal.). Without an outside force (a transcendent, omnipotent, eternal, superior Being), no other options for the existence of the Universe are available. However, as the Laws of Thermodynamics prove, the spontaneous generation and the eternality of matter are logically and scientifically impossible. One possible option remains: the Universe was created by the Creator. Evolutionists claim that science and the idea of God are irreconcilable. “Only one of them can be the truth,” they say, “and you cannot prove there is a God.” However, the Laws of Thermodynamics, which science itself recognizes in its explanations of the phenomena in the Universe, were designed by the Chief Engineer. As expected, they prove to be in complete harmony with His existence, contrary to the claims of evolutionists. God, Himself, articulated these laws centuries ago. At the very beginning of the Bible, the First Law of Thermodynamics was expressed when Moses penned, “Thus the heavens and the earth, and all the host of them, were finished. And on the seventh day, God ended His work which He had done, and He rested on the seventh day from all His work which He had done” (Genesis 2:1-2, emp. added). After the six days of Creation, the mass/matter/energy creation process was terminated. As evolutionist Willard Young said regarding the First Law: “Energy can be neither created nor destroyed, but can only be converted from one form to another” (Young, 1985, p. 8). Through the hand of the Hebrews writer, God also articulated centuries ago what scientists call the Second Law of Thermodynamics: “You, Lord, in the beginning laid the foundation of the earth, and the heavens are the work of Your hands; they will perish, but You remain; and they will all grow old like a garment” (1:10-11, emp. added). The inspired writer wrote in Hebrews 11:3, “By faith we understand that the worlds were framed by the word of God, so that the things which are seen were not made of things which are visible.” Paul declared in Acts 14:17, “Nevertheless He did not leave Himself without witness, in that He did good, gave us rain from heaven and fruitful seasons, filling our hearts with food and gladness.” The psalmist affirmed, “The heavens declare the glory of God; and the firmament shows His handiwork” (19:1). Paul assured the Romans, “For since the creation of the world His invisible attributes are clearly seen, being understood by the things that are made, even His eternal power and Godhead, so that they are without excuse” (1:20, emp. added). In closing, we return to Lord Kelvin, the Father of Thermodynamics, for fitting final thoughts. I cannot admit that, with regard to the origin of life, science neither affirms nor denies Creative Power. Science positively affirms Creative Power. It is not in dead matter that we live and move and have our being [Acts 17:28—JM], but in the creating and directing Power which science compels us to accept as an article of belief.... There is nothing between absolute scientific belief in a Creative Power, and the acceptance of the theory of a fortuitous concourse of atoms.... Forty years ago I asked Liebig, walking somewhere in the country if he believed that the grass and flowers that we saw around us grew by mere chemical forces. He answered, “No, no more than I could believe that a book of botany describing them could grow by mere chemical forces”.... Do not be afraid of being free thinkers! If you think strongly enough you will be forced by science to the belief in God, which is the foundation of all religion. You will find science not antagonistic but helpful to religion (as quoted in Smith, 1981, pp. 307-308, emp. added). So, according to the Father of Thermodynamics, evolutionists are failing to “think strongly enough.” No wonder the psalmist asserted: “The fool has said in his heart, ‘There is no God’” (14:1). Cengel, Yunus A. and Michael A. Boles (2002), Thermodynamics: An Engineering Approach (New York: McGraw-Hill), fourth edition. Incropera, Frank P. and David P. DeWitt (2002), Fundamentals of Heat and Mass Transfer (New York: John Wiley & Sons), fifth edition. Isaak, Mark (2003), “Five Major Misconceptions about Evolution,” The TalkOrigins Archive: Exploring the Creation/Evolution Controversy, [On-line], URL: http://www.talkorigins.org/faqs/faq-misconceptions.html#proof. Jastrow, Robert (1978), God and the Astro­nomers (New York: W.W. Norton). Kenny, Anthony (1980), The Five Ways: St. Thomas Aquinas’ Proofs of God’s Existence (South Bend, IN: University of Notre Dame Press). King, A.L. (1962), Thermophysics (San Francisco, CA: W.H. Freeman). Moran, Michael J. and Howard N. Shapiro (2000), Fundamentals of Engineering Thermodynamics (New York: John Wiley & Sons), fourth edition. Rifkin, Jeremy (1980), Entropy: A New World View (New York: Viking). Smith, Wilbur M. (1981), Therefore Stand (New Canaan, CT: Keats Publishing). Suplee, Curt (2000), Milestones of Science (Washington, D.C.: National Geographic Society). Thompson, Bert, Brad Harrub, and Branyon May (2003), “The Big Bang Theory—A Scientific Critique [Part 1],” Reason & Revelation, 23:32-34,36-47. Thompson, Silvanus P. (1910), Life of Lord Kelvin (London: Macmillan). Walters, Tracy (1986), “A Reply to John Patterson’s Arguments,” Origins Research, 9:8-9, Fall/Winter. Young, Willard (1985), Fallacies of Creationism (Calgary, Alberta, Canada: Detselig Enterprises).